This healthy vegan smoothie is packed full of vitamins and given a gentle kick with eastern spices. Each smoothie provides 197 kcal, 4g protein, 18g carbohydrate (of which 14g sugars), 12g fat (of which 10g saturates), 2.5g fibre and 0.4g salt. Blend the beetroot with two-thirds of the banana and all of the remaining ingredients until completely smooth. 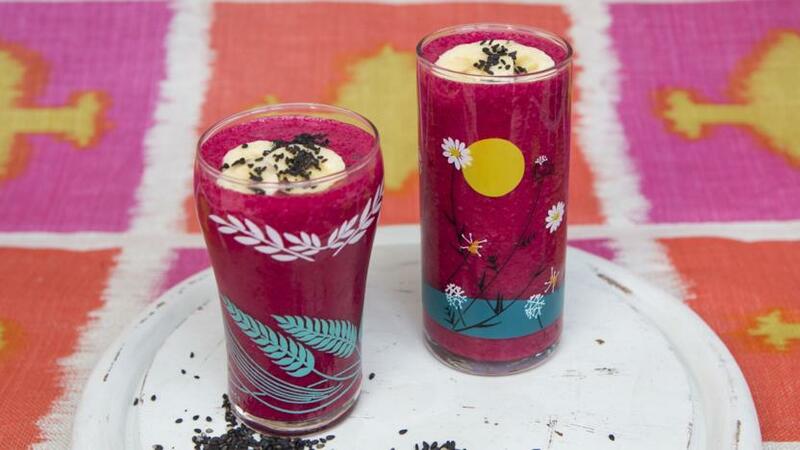 Divide the smoothie between two tall glasses. Garnish with the banana slices and a sprinkling of sesame seeds or cacao nibs. Tip 1: If you have a strong juicer you could use raw beetroot instead of cooked. Tip 2: To get to the cardamom seeds, split the pod by crushing it with the flat blade of a knife and remove two seeds. Alternatively, use a pinch of ground cardamom.